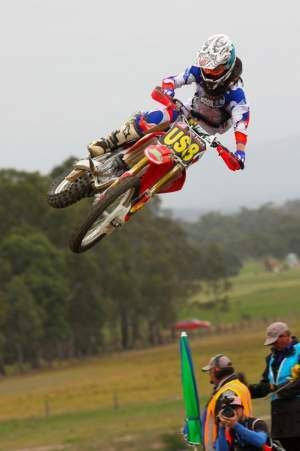 Racing has now finished at the 2009 Honda Australian Junior Motocross Championship, and the points are in for all sixteen championship classes with the new champs to be crowned at a presentation dinner on Saturday night. Throughout the week, more than two thousand people have descended on the Gippsland area and with just under seven hundred riders taking part in the event, the Maffra Sale Motorcycle Club have done an excellent job. Club President Mark Tyquin said that he couldn’t have been prouder of the club and the organizing team for their efforts throughout, not only the last week but also the last eighteen months. “Everyone has put in such a massive effort to make this event happen and it’s been such a great week,” Tyquin said. “The entire team: club volunteers, race officials, Race Solutions, all of our sponsors, the local council and community, all of the rider’s and their families all need to be thanked for making this possible. After their strong performances throughout the week, the American riders didn’t disappoint, with Kyle Peters winning the 200-250cc four stroke 15 years class ahead of Queenslander Shaun Redhead who also won the 100-150cc two stroke 15 years class. 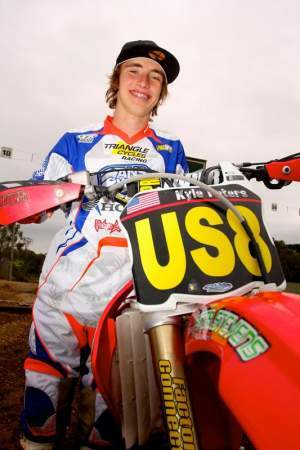 US compatriot Joey Savatgy battled against Jacob Wright with the American emerging the victor in both the 100-150cc 2 stroke 13 to under 15 years and 200-250cc 13 to under 15 years classes leaving the Australian to settle for second. It was a good week for Clout who also took out the 150cc four stroke 14 to under 16 years following Friday’s competition while Victorian rider Wayde Carter took out the nine to under 12 years 100-150cc class. Ballarat’s Joel Milesevic took out the 85cc four stroke 12 to under 14 years Championship, with Queensland’s Jesse Dobson winning the 85cc two stroke nine to under 12 years class. In the 100 to 150/200 to 250cc 13 to under 16 years class, reigning champ Meghan Rutledge who hails from Picton, New South Wales, took out the 2009 Title ahead of New South Wales’ Mackenzie Tricker who wrapped up the week in second place. Meanwhile New Zealand rider Courtney Duncan made it a clean sweep, winning all the races in the Female 85cc/150cc 12 to under 16 years class, and managed an impressive fifth place against the guys after crashing in the final race of the 85cc two stroke 12 to under 14 years class. Kurt Waterman, from Palmer, South Australia, won the 150cc four stroke 12 to under 14 years class by only one point ahead of Queensland’s Nicklas Scott, with Wilson Todd taking out the 65cc nine to under 11 years class only four points ahead of Mitchell Evans. Elias Dukes took out the 65cc 11 to under 13 years class with Taj Marshall winning the seven to under nines 65cc class and Rhys Budd winning the 50cc Division two class.